I'm new here and have always been keen on the artwork from the comics that I used to read as a young girl - mainly Bunty, but also Mandy, Tammy, Judy etc and also my mother's old School Friends. Ever since I remember, there was one artist whose artwork I loved and I always enjoyed the stories that they illustrated. I spent the past 25 years wondering who this artist was, but a very knowledgeable lady has just helped me to identify him as Douglas Perry. Sadly though, she doesn't know anything more about him. Douglas Perry was the second artist who illustrated the longrunning strip Molly Mills in Tammy (see the 1982 Tammy annual). 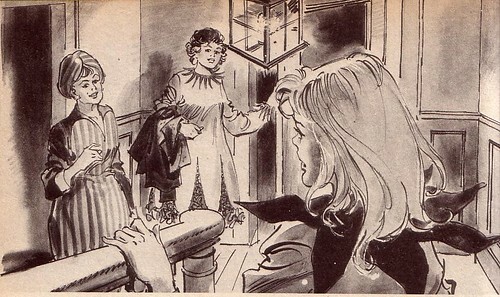 Strips I remember from Bunty include "The Seven Sisters" (c1988, Victorian orphan tracks down her longlost siblings using a sapphire necklace), "Little Miss Lonely" (c1988, bored 16 year old starts volunteering in a local hospital and realises she wants to train as a nurse), and "T for Trouble" (1985 Bunty annual) .The earliest strip that I have identified by him is "Go Girl Go" from the 1971 Mandy album so he was definitely producing work for both IPC/Fleetway and DC Thompson. It would be fantastic to learn more about this artist, as he was a massive inspiration to me regarding my own love of drawing! Hi, Tonibunny. I can't help with your query but welcome to the Comics UK forum. here's a 'GO GIRL', Toni, but it's from Bunty, and sadly unconnected to your query. I also discovered this BUNTY annual cover for the first time, it looks a real early job. Hope someone can help you with your subject----girl's comics are not my strong-point, though I did read my cousin's in the early 70s-----but welcome to the forum anyway. 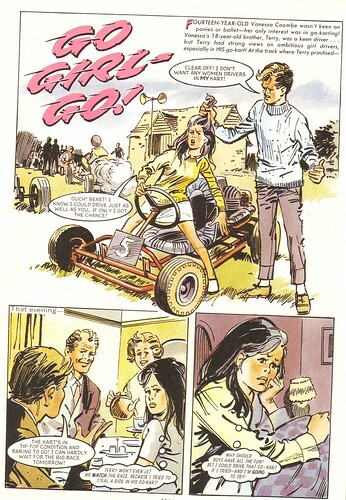 The "Go Girl" that Douglas Perry illustrated was a picture story about a girl who drove her brother's Go Kart, so sadly as you say the cut out wardrobe below is by someone else. I'll get some of Perry's work scanned in so you can all take a look though, and see if you recognise his style. That cover is ace, I've never seen it before. I don't have any very old Buntys though, just 1970s-80s ones. Oh and I bought the Bunty Book 2009 to see what had changed....it made me sad, except that there's a recycled John Armstrong story in there. Nice to see his work being kept alive somehow! Eh? The only missing covers in the gallery are 2007-2009. So either this wasn't the first one, or that's not an annual. It seems to be an image from an annual, Digi, going by the JOHN LENG reference on the cover.....though I honestly can't say for sure.....the colour scheme suggests this illustration is from an annual....at a guess, I'd say it's maybe an introductory inner illustration on page 5 or thereabouts. Which would explain why this image is unfamiliar. The early comics certainly never used full-colour painting of this quality, unless it was in the Summer Specials.......but I honestly can't remember there being early JUDY/MANDY etc summer specials. This image is definately designed like an annual cover and not an inner-page...maybe it was mooted for cover status but later got relegated to 'inside job'. That Bunty illustration is an internal title page from an annual and not a cover Rab. When I get the chance to look I'll be able to tell you which one. line with the Denis Gifford mistake of thinking that the 1969 Bunty Summer Special was the first one when in fact the Bunty had had its own summer special since 1963. Yes the DC Thomson credit would have been on the frontpiece and never on the cover. Tonibunny if you can show us an example of Perry's art it will greatly help as DC Thomson never allowed artists to sign their work and so we would be more familiar with his style. There are several other artists I'd love to identify, so I may do a separate thread for them if that's OK? That illustration was the inside title page of the Bunty Book for 1963. The style of Douglas Perry looks very inspired by girl's comics artwork around 1970, Toni: [well, the first one IS 1971, and this style does appear familiar] back then, there were no photostories in JACKIE, etc, but lots of large-format strips very reminiscent of what you have shown here. Keep 'em coming, though.......it's all recognition of UK comics history. That's for clearing up the mystery of the frontspiece of the 1963 Bunty annual, kashgar: when I see the name JOHN LENG in a DCT annual, I know I'm in for a vintage treat! Here's some annual covers I have long admired, Toni: the stark black backgrounds really makes these images stand out [artist unknown, unfortunately]. It's a great shame that so many artists and writers in the field of girl's comics are so uncredited.